Featuring fresh baked muffins, scones, bars, pies and cakes. Great lunch specials, senior nutrition site! Carry outs available. Open at 6am. Click Picture for Info. 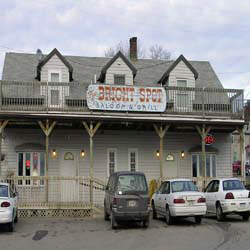 Base camp for hungry and thirsty hunters, fishermen, road workers and loyal local patrons. Breakfast, Lunch, Dinner. Restaurant. Bait Shop. Liquor Stop. Corner store. LaCrosse’s premier steak and seafood restaurant, known for it’s fabulous staff, great food and beautiful atmosphere! Great River Road, 10mi N of Prairie du Chien. Bar, Food, Boat Launch ($30/yr, $2/launch), Gas, Bait, Campsites from $3/night. Specialty homemade pizza, great lodge atmosphere. "#1 Pizza Pick on the Upper Mississippi River". Click Picture for Full Page Ad.